Diocese of Miami is created, with 51 parishes; 65 diocesan priests; and 21 Religious Order clergy ministering to 185,000 Catholics in 16 counties in southern Florida. Most of the rest of the state is covered by the original Diocese of St. Augustine. 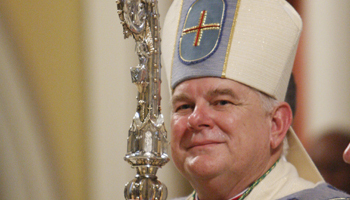 Bishop Coleman F. Carroll, formerly Auxiliary Bishop of Pittsburgh, is installed as First Bishop of Miami. 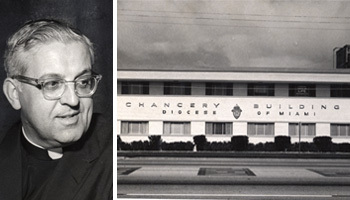 First minor seminary in southeastern United States, St. John Vianney College Seminary, is established in Miami. Tremendous program of expansion, due to influx of Cuban refugees as well as Catholics from the northern United States. The diocese bears the brunt of the Cuban exile exodus for a full year prior to receiving federal government assistance. Ecclesiastical Province of Miami is established: Diocese of Miami is elevated to the rank of Archdiocese and two new Florida dioceses are created, Orlando and St. Petersburg; Florida now is divided into four Catholic dioceses including St. Augustine. Miami yields eight counties to the new dioceses. On its tenth anniversary, the Miami Archdiocese consists of 85 parishes and 10 missions in eight counties. A Catholic population of 400,000 is served by 164 diocesan priests, 141 Religious Order clergy, and about 900 women religious. The diocese's Radio and TV Department is the first diocesan agency in the nation to inaugurate closed-circuit TV to schools and churches. 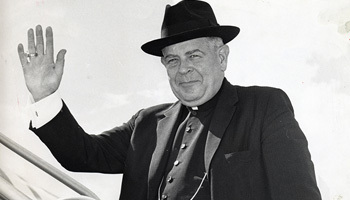 Archbishop Edward A. McCarthy, a native of Cincinnati and founding Bishop of Phoenix, arrives in Miami as coadjutor with right of succession to Archbishop Coleman Carroll. Archbishop Carroll dies, and Archbishop McCarthy succeeds to the See. Two new auxiliary bishops are appointed for Miami, including the first native Cuban to serve as a bishop in the U.S. in 200 years: Auxiliary Bishop Agustin Roman. 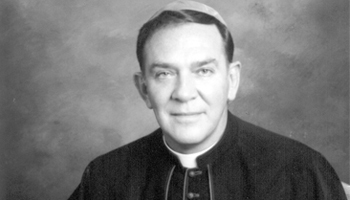 His fellow Auxiliary Bishop is John J. Nevins, another Archdiocesan priest. Both of them are consecrated March 24, 1979. (Bishop Nevins is currently Bishop of Venice, FL). 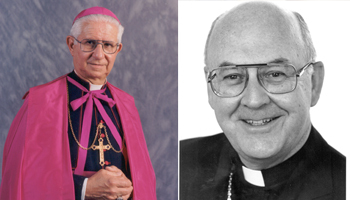 Archbishop McCarthy re-organizes the Archdiocese into seven major divisions: General Services, Temporalities, Christian Formation, Worship and Spiritual Life, Christian Service, Pastoral Ministry and Ministry to Persons. He also announces plans for the construction of the Pastoral Center and St. Martha Church at 9401 Biscayne Blvd. in Miami Shores. Archbishop McCarthy announces the start of a five-year plan of evangelization. Mariel boatlift brings nearly 125,000 Cuban refugees to South Florida, and Haitians begin arriving in significant numbers as well. Throughout the next decade, the Archdiocese will speak forcefully on behalf of the Haitians' right to plead for asylum in this country, and against presidential directives that call for high-seas interdiction of boatloads of Haitian refugees. Archbishop McCarthy announces the establishment of a Haitian pastoral center, later called the Pierre Toussaint Center, to be located across the street from St. Mary Cathedral, in the former cathedral rectory. The Pierre Toussaint Center will serve the spiritual and social needs of Miami’s ever-growing Haitian population. Father Marcel Peloquin, a Missionary Oblate of Mary Immaculate who spent 28 years in Haiti, will serve as director, with Father Thomas Wenski, who recently returned from studies in Haiti, serving as associate director. The center will later move to its current site next to Notre Dame d’Haiti Mission in Miami. Father Wenski’s “circuit-riding” ministry to Haitian Catholics throughout the archdiocese will result in the establishment of Haitian missions as far north as Palm Beach, including Divine Mercy in Fort Lauderdale and St. Joseph in Pompano Beach. 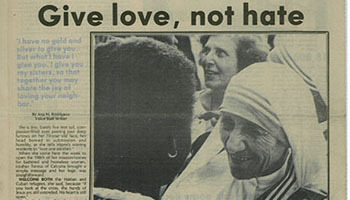 Mother Teresa comes to Miami to open a shelter for homeless women. On its 25th anniversary, which is celebrated December 8 with a Mass at the Orange Bowl, the eight-county Archdiocese includes more than 896,000 Catholics, with 135 parishes and three missions, served by 312 diocesan and 210 Religious Order priests; 643 women religious and 63 men religious; and 45 permanent deacons. In April, the Archdiocesan staff moves into its new home at the Pastoral Center. The Kenedy Directory lists the Archdiocese of Miami as the second fastest growing See in the nation. The Archdiocese of Miami is divided once more, yielding Palm Beach and Martin counties to the newly-created Diocese of Palm Beach; and Glades, Hendry and Collier counties to the newly-created Diocese of Venice. Now, the Archdiocese of Miami consists of three counties, Dade, Broward and Monroe, with more than 527,000 registered Catholics served by 100 parishes, two missions, 279 diocesan priests, 164 Religious Order priests, 445 women religious, 63 men religious and 55 permanent deacons. Hispanics make up 62 percent of the Catholics in the Archdiocese, and 80 percent of the Catholics in Dade County; blacks (African-Americans and Haitians) make up less than 4 percent of the Catholic population, and Asians make up about 1 percent. About 25 percent of the Catholic population has moved here in the past five years; another 25 percent have lived here for the past 20 years. 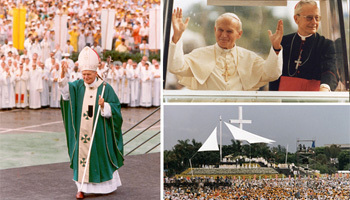 Pope John Paul II visits Miami. After being greeted by President and Mrs. Reagan at the airport, he travels to St. Mary Cathedral, where he is formally greeted by Archbishop McCarthy and religious dignitaries, as well as a cheering throng of Haitians who gather outside. He then travels to St. Martha Church for a meeting with representatives of the nation’s priests; stops to greet Catholic employees and parishioners at the Pastoral Center next door; and parades through Biscayne Boulevard in his “popemobile” before retiring to the Archbishop's residence. The next morning, he meets with Jewish leaders and tours a Vatican Judaica exhibit at Miami’s Center for Fine Arts; then celebrates Mass for nearly a quarter-million people at the Dade County Youth Fairgrounds. Rain and lightning strikes force a premature end to the Mass, which is halted during the Pope’s homily. The Pope and bishops finish celebrating Mass in a nearby trailer. Before departing for the airport, the Pope returns to the outdoor altar to greet and bless a few hundred Catholics who have remained at the Mass site, hoping for another glimpse of the Pontiff. On its 30th anniversary, the Archdiocese numbers more than 596,000 registered Catholics in 105 parishes and three missions. They are served by 177 diocesan priests, 146 Religious Order priests, 432 women religious, 58 men religious and 72 permanent deacons. Increased sensitivity to the needs and languages of the different cultural and ethnic groups of the Archdiocese. In preparation for the 500th anniversary of the arrival of Christianity in the New World, the Archdiocese hosts a Festival of Faith at the Miami Beach Convention Center. The festival features information booths and exhibits by representatives of all the parishes, institutions and groups in the Archdiocese, daily Masses and opportunity for prayer and confession. Hurricane Andrew, the first Category 4 storm to hit a highly populated urban area in the United States, strikes South Florida, wreaking vast damage on the southernmost part of Dade County. The damage to Catholic facilities is estimated at $130 million. Archdiocesan personnel and volunteers from unaffected parishes flock to repair the damage and aid those left homeless. Dioceses in Florida and across the United States take up a collection for South Florida, and the Archdiocesan Hurricane Relief Fund reaches $3 million by the end of the year. The money is disbursed to families and individuals in need of housing, food and other assistance, especially migrant farmworkers left homeless and jobless because of the damage to farms and nurseries in the area. The task of rebuilding continues for months. To symbolize its unity with those affected by the storm, the Archdiocese marks its 34th anniversary in October with an outdoor Mass in South Dade; the altar is built out of hurricane debris. The Archdiocese establishes Radio Peace, a 13-hour a day, tri-lingual broadcast on time bought from WKAT, 1360 AM. 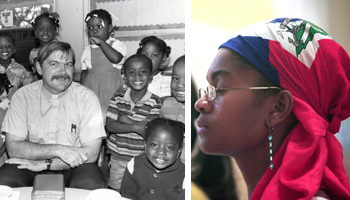 The programming is in Spanish from 6 a.m. to 2 p.m., in English from 2 p.m. to 6 p.m., and in Haitian Creole from 6 p.m. to 7 p.m. Radio Peace features a children's program, talk shows, spiritual music, prayer and news. At the Vatican-mandated age of 75, Archbishop McCarthy submits his resignation to Pope John Paul II, but continues to run the Archdiocese until the Holy See appoints a successor. The Archdiocese now consists of 107 parishes and three missions in three counties, with a registered Catholic population of more than 681,000 served by 198 diocesan priests, 127 Religious Order priests, 406 women religious and 56 men religious, and 103 permanent deacons. Little Flower Church in Coral Gables is the site of the annual Easter Mass broadcast nationally by the NBC network. The Archdiocese ordains 11 men, its largest group of new priests in 16 years: Nine are ordained before hundreds of people at the James L. Knight Center in Miami; the other two in their home towns in Nicaragua and Puerto Rico. The newly-ordained include the Archdiocese’s third Haitian priest; four more Nicaraguans; two Cuban-Americans; two Puerto Ricans; one Anglo and one Colombian. Archbishop McCarthy marks the 50th anniversary of his ordination to the priesthood with a gala dinner tribute which raises $235,000 for the newly-established Edward A. McCarthy Foundation for Child Care, whose aim is to support needy children throughout the Archdiocese. A year after Hurricane Andrew, the Archdiocese reports that it received more than $7 million in donations from around the country, including $1 million from its sister dioceses in Florida. Nearly $4 million has been spent to assist victims, directly or indirectly through the Archdiocese’s parishes, schools and social service agencies. The remainder will be spent over the next five years, by funding additional social service programs in South Dade. The Archdiocese’s rules, regulations and operating procedures, from the hiring of teachers to the vacations of priests to reporting child abuse and preparing for a hurricane, were published in book form for the first time. Copies of the “Pastoral Manual: The Guidelines and Directives of the Archdiocese of Miami, 1993” are made available to the public, not just to Archdiocesan priests, Religious and lay employees. The Archdiocese marks its 35th anniversary, and Archbishop McCarthy takes the opportunity to propose yet another evangelization plan. This time, he urges Catholics to bring their faith values to the forefront of the secular world, by becoming involved in politics and voter registration drives. He also introduces a Pastoral Plan for Youth Ministry, urging parishes, among other things, to hire fulltime youth ministers, make Masses relevant to young people and establish Catholic clubs in public schools. Thousands of Cuban rafters take to the seas, fleeing Communism and dire economic conditions in their homeland. After being rescued by the U.S. Coast Guard, most are placed in temporary detainment camps in Guantanamo Naval Base in Cuba. They languish there while the Clinton Administration decides whether or not to admit them to the United States. The Archdiocese of Miami asks for Spanish-speaking priests to volunteer to work at the camps for rotating periods of time, and Archbishop McCarthy and Auxiliary Bishop Roman also travel to Cuba to visit and bring hope to the refugees. 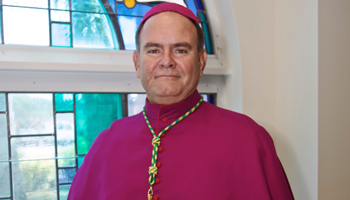 Bishop John Clement Favalora, a native of New Orleans, Louisiana who has served as Bishop of St. Petersburg since 1989, is appointed to succeed retired Archbishop Edward A. McCarthy as Archbishop of Miami. Archbishop Favalora is installed as the third Archbishop of Miami during a ceremony at St. Mary Cathedral, which is filled with priests, religious and civic dignitaries. 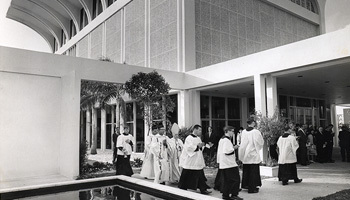 To accommodate the many people who could not attend the Cathedral ceremony, a public Mass of Welcome for the new archbishop is offered at the Miami Beach Convention Center in January 1995. 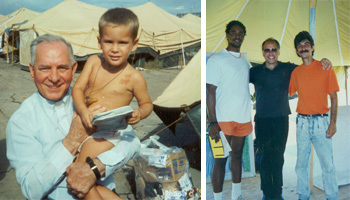 Archbishop Favalora pays a visit to the Cubans and Haitians detained at the refugee camps in Guantanamo. A week later, the Archdiocese opens Varela Centers at several South Florida Catholic schools, in order to teach English to Cuban and Haitian children just released from the camps. The schools will help the children and their parents prepare for life in the U.S.
Cardinal Jaime Ortega of Havana makes an official pastoral visit to South Florida, celebrating Mass at St. Mary Cathedral; vespers at the Shrine of Our Lady of Charity on Biscayne Bay; and an outdoor Mass at St. Thomas University in Miami. Throngs greet him at every site. The cardinal calls for unity among Cubans, both those in exile and those inside the island. The visit to South Florida is part of a pastoral visit to Cubans in exile which also includes stays in New York, Chicago and Tampa. Archbishop Favalora receives his pallium from Pope John Paul II in Rome. The pallium signifies his status as Metropolitan of the Province of Miami, which includes all of Florida. Msgr. Bryan O. Walsh, longtime director of Catholic Charities for the Archdiocese and a world-renown advocate of immigrants and refugees, retires after more than 40 years on the job. His plans include teaching a class in Oxford, England, on the needs of immigrants and refugees. 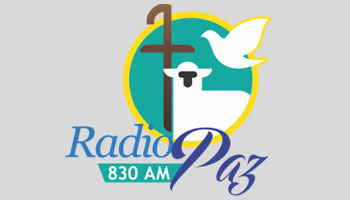 Radio Paz, the Spanish-language archdiocesan radio programming, begins broadcasting 24 hours a day on WACC-830 AM. The archdiocese at first leases the station, then purchases it a year later. Radio Peace, the English-language programming, will continue to air on WAXY 790-AM from 1 p.m. to 6 p.m. weekdays. 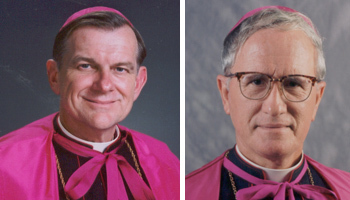 Two new auxiliary bishops are appointed for the Archdiocese of Miami: Father Thomas Wenski, director of Catholic Charities and of the Ministry to Cultural Groups in the Archdiocese; and Father Gilberto Fernandez, longtime South Florida pastor and native of Cuba. The ceremony of episcopal ordination takes place Sept. 3 at the Miami Arena, with thousands of South Florida Catholics joyously participating. 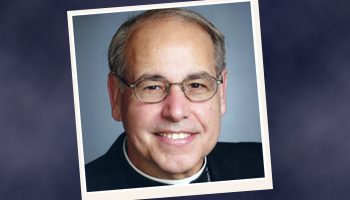 Archbishop Favalora travels to Rome to take part in the Synod of Bishops for America. Archbishop Favalora leads a group of about 180 pilgrims on a nine-hour visit to Havana, Cuba, to attend Pope John Paul II’s Mass in the civic plaza. The pilgrims include the cardinals of Los Angeles and Detroit, most of Florida’s bishops, Cuban laity and priests from South Florida and elsewhere, as well as many Anglos from other parts of the U.S. 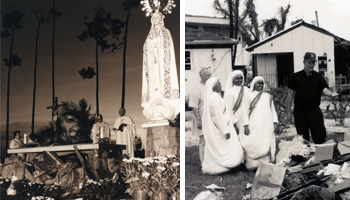 Originally, the archdiocese had leased a cruise ship to take nearly 1,000 people on a three-day pilgrimage which would have included a memorial service at sea for those who lost their lives trying to flee the island; a Mass at Havana’s cathedral; visits to Havana area parishes; and the papal mass. Transportation aboard the ship would have resolved the issue of hotel lodging and meals for the pilgrims without violating the U.S. embargo against spending more than $100 a day in Cuba. 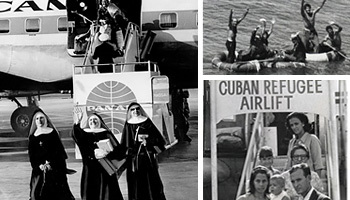 However, after listening to months of protests from the Cuban exile community, who objected to a cruise ship as the means of transportation, the archbishop canceled the pilgrimage by sea and quickly organized the smaller, direct, charter flight. 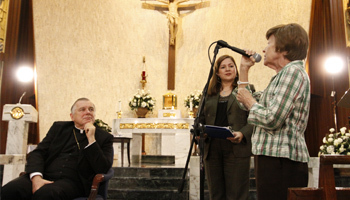 Renew 2000, a program of spiritual preparation for the Great Jubilee 2000, is launched in the archdiocese. The program calls on parishes to foster small faith-sharing groups that meet on a regular basis, during the seasons of Lent and Advent, to discuss scripture and how it applies to their lives. The three-year program is expected to renew parishes by enabling church-goers to meet and get to know their fellow parishioners. 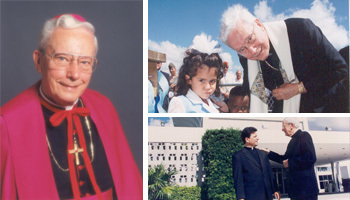 On the 40th anniversary of its establishment, the Archdiocese of Miami consists of 108 parishes and three missions in three counties, with a registered Catholic population of more than 774,000 served by 265 diocesan priests, 122 Religious Order priests, 345 women religious and 56 men religious, and 128 permanent deacons. Catholic Charities mobilizes to help the victims of Hurricane Mitch in Central America. The nations hardest-hit were Honduras, Nicaragua and El Salvador, where thousands died and entire villages were destroyed when swollen rivers overflowed. In a joint private-public effort, thousands of pounds of food and emergency supplies collected at local fire stations and by private agencies were sorted and shipped through Catholic Charities of the Archdiocese of Miami. The extent of the devastation also prompted Catholic Relief Services to announce a $500 million effort not only to rebuild the infrastructure of the hardest-hit nations but also to reshape the unjust social structures that increased the damage wrought by the storm. In order to avoid even the appearance of corruption, and ensure that the help reaches the needy, the governments of the affected nations agreed to allow the church and other international relief organizations to administer and distribute the aid. Archbishop Favalora announces plans for Vision 2000, a campaign to generate a $75 million endowment that will enable the Church in South Florida to continue its educational and charitable ministries into the 21st century. Catholic Charities teams up with Florida’s Department of Children and Families in a unique program to recruit foster and adoptive parents from among Catholic parishioners in South Florida. The goal is to reduce the backlog of needy children who linger in foster care by finding good homes where they can rebuild their lives. Archbishop Favalora and his auxiliary bishops become the first to be fingerprinted under a new policy that requires background checks of all archdiocesan employees, including priests, deacons, religious and volunteers. Approved in 1998 by the Catholic bishops of Florida, the statewide program aims to reassure the public regarding people who work with the elderly, children and the disabled. The fingerprinting must be completed by September 2000. During the Christmas Eve Mass, Archbishop Favalora opens the Holy Doors at St. Mary Cathedral to symbolize the beginning of the Great Jubilee Year 2000. A weekend-long Jubilee celebration takes place in March at the Miami Beach Convention Center, and a Mass is celebrated in Broward County in November, on the feast of Christ the King. Vision 2000 concludes after having raised $110 million in endowments for the Archdiocese. Archbishop Favalora concludes Great Jubilee Year 2000 celebrations with a vigil Mass for the feast of the Epiphany at a park in Key West; the next day he closes the Holy Doors at St. Mary Cathedral to symbolize the official end of the Jubilee Year. Auxiliary Bishop Gilberto Fernández, 67, announces his retirement from active ministry due to failing health. 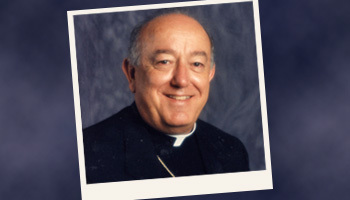 Auxiliary Bishop Agustín Román turns 75 and submits his resignation to the Holy See, which accepts it June 7, 2003. The bishop is retiring from his official duties as auxiliary bishop although he will continue to minister at the National Shrine of Our Lady of Charity, where he has worked and lived since 1968. In a rite dating back to the earliest centuries of the church, Kathleen Danes, 62, becomes the Archdiocese’s first consecrated virgin. During the ceremony at St. Mary Cathedral, Archbishop Favalora gives her a ring, signifying her marriage to Christ, and a book of the Liturgy of the Hours, signifying her special union with the church. Danes has a degree in public administration and is a member of St. Paul the Apostle Parish in Lighthouse Point. She joins the growing ranks of consecrated women across the world, women who live in the world yet remain chaste for Christ. Miami Auxiliary Bishop Thomas G. Wenski is appointed coadjutor to Bishop Norbert Dorsey of Orlando, Fla. His welcome ceremony there is set for Aug. 22, feast of the Queenship of Mary. In compliance with the U.S. bishops’ “Charter for the Protection of Children and Young Adults,” approved in Dallas in June, 2002, the archdiocese issues a revamped “Policy and Procedural Guidelines … Relating to Protection of Children and Vulnerable Adults.” The new policy updates guidelines that had been established in the archdiocese since the mid-1980s, and revised in the 1990s. Also in compliance with the bishops’ charter, the archdiocese selects a Safe Environment program, VIRTUS, and appoints Marist Brother Joseph Teston to coordinate its implementation. Vicki Kaufmann, chief operating officer of Catholic Charities, is appointed Victims Assistance Coordinator, with a toll-free number where those who may have been abused by archdiocesan clergy or lay personnel may seek referrals and counseling. Dianne Trillo is hired as human resources generalist to implement the fingerprinting and background checks that are required of all archdiocesan employees and parish volunteers. Msgr. 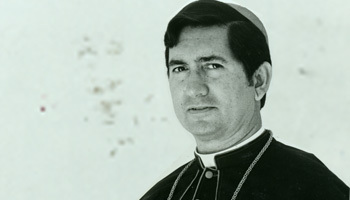 Felipe de Jesús Estevez, former pastor of St. Agatha Church in Miami (1987-2001) and spiritual director at St. Vincent de Paul Regional Seminary in Boynton Beach, is appointed the eighth auxiliary bishop of the archdiocese, becoming the fourth Cuban to be appointed bishop in the United States in modern times. His ordination ceremony takes place Jan. 7, 2004, at St. Mary Cathedral. The archdiocese publishes, “A Time to Heal,” an eight-page special section in The Florida Catholic and La Voz Católica, which reveals the total number of sexual misconduct allegations against archdiocesan priests, religious and laity since the archdiocese’s founding in 1958, as well as the dollar amount of settlements and legal fees paid out since the Archdiocese of Miami Insurance Programs were established in 1966. “To help restore the bonds of trust and communion, I present this report on where the Archdiocese of Miami stands in this national scandal and our response to it,” writes Archbishop Favalora in a letter introducing the report, which is also posted on the archdiocesan website: www.miamiarch.org. 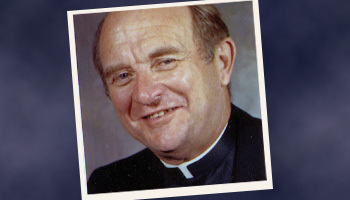 Archbishop Emeritus Edward A. McCarthy dies in his sleep at the age of 87. His funeral Mass was celebrated June 13, with Auxiliary Bishop Agustín Román preaching the homily, and the late archbishop’s sister, brother, nieces and nephews in attendance. He was buried in the priests’ section of Our Lady of Mercy Cemetery in Miami. Msgr. John Noonan, 54, who serves as rector of St. John Vianney College Seminary, is named the ninth auxiliary bishop of the Archdiocese of Miami. He is the first Irish-born Florida priest to be named a bishop since the death of Bishop Patrick Barry in 1940. His ordination takes place Aug. 24, 2005. 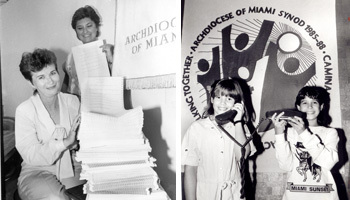 On its 50th anniversary, the archdiocese consists of 111 parishes and 7 missions in Miami-Dade, Broward and Monroe counties. More than 750,000 registered Catholics are served by 264 diocesan priests, 89 religious order priests, 150 permanent deacons, 314 women religious and 55 men religious. Six of the archdiocese’s 59 elementary schools announce they will close at the end of the school year due to falling enrollments and rising costs: Corpus Christi in Wynwood, Our Lady of Divine Providence in Sweetwater, Sacred Heart in Homestead, St. Clement in Fort Lauderdale, St. Francis Xavier in Overtown and St. Stephen in Miramar. Eventually, charter schools move into all of those locations, leasing the buildings from the local parish. Due to the ongoing financial crisis, the archdiocese announces the closing of its Youth Ministry Office. This means ministry to teens up to age 17 and young adults ages 18 and older will be handled entirely at the parish level. The Respect Life Office also will no longer receive any funding from the archdiocese but depend entirely on donations to carry out its work. The archdiocese announces the merger of eight parishes, five missions and one apostolate. Effective Nov. 1: Divine Mercy Haitian Mission merges into St. Clement Parish in Fort Lauderdale; Resurrection Parish in Dania merges into St. Maurice in Dania Beach; St. Charles Borromeo merges into St. Matthew in Hallandale; St. George merges into Our Lady Queen of Martyrs in Fort Lauderdale; St. Joseph Haitian Mission merges into St. Elizabeth of Hungary in Pompano Beach; St. Luke Parish in Coconut Creek and Our Lady Aparecida Brazilian Mission in Hollywood both merge into St. Vincent in Margate; the Vietnamese apostolate becomes part of St. Helen Parish in Fort Lauderdale; Our Lady of Perpetual Help in Opa-Locka merges into St. James in North Miami; St. Cecilia merges into St. John the Apostle in Hialeah; St. Francis Xavier Mission in Overtown merges into Gesu in downtown Miami; St. Philip Neri Mission merges into St. Monica in Miami Gardens; St. Robert Bellarmine merges into Corpus Christi in Miami; St. Vincent de Paul in Miami merges into St. Rose of Lima in Miami Shores. The Archdiocese of Miami now numbers 103 parishes and two missions in Miami-Dade, Broward and Monroe counties. Father Fernando Isern, pastor of Our Lady of Lourdes Parish in Kendall, is appointed bishop of Pueblo, Colo., becoming the 11th Miami priest to be named a bishop since the archdiocese was established. Two archdiocesan elementary schools announce they will close at the end of the school year due to rising costs and falling enrollment: St. Joseph on Miami Beach and St. Elizabeth of Hungary-St. Joseph in Pompano Beach. This brings the total number of elementary schools in the archdiocese to 48, along with 13 secondary schools. 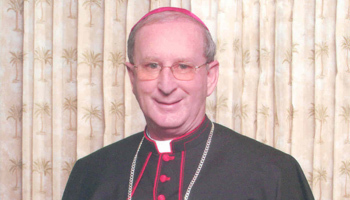 Pope Benedict XVI names Bishop Thomas Wenski of Orlando, a former Miami priest and auxiliary bishop, as the fourth Archbishop of Miami, accepting at the same time the retirement of Archbishop John C. Favalora, who will turn 75 — the Vatican-mandated retirement age — in December 2010. Archbishop-elect Wenski is installed June 1, 2010 at St. Mary Cathedral. Divine Mercy Haitian Mission in Fort Lauderdale reopens in May 2015 as St. Jude Knanaya Parish, a home for Indian Catholics of the Syro-Malabar Church, one of the Eastern Churches in communion with the Vatican. At the annual Chrism Mass with archdiocesan priests, Archbishop Wenski convokes a General Synod of the Archdiocese of Miami, the second in the local Church’s history. This one will only last about one year. It begins with 10 listening sessions June 15-30, 2012: five in English, three in Spanish and two in Creole; one in Monroe County, five in Miami-Dade and four in Broward. During the sessions, participants will be asked three questions: What is the Church of Miami doing well? What can the Church of Miami do better? What three priorities should the archdiocese focus on in the next three to four years? The listening sessions will last two hours and the archbishop will be present at all of them, simply to listen. Those who cannot attend a listening session in person can answer the same three questions in an online form. The listening period continues through the end of September, concluding with a listening session totally focused on youth and campus ministry. More than 2,500 Catholics take part in the Synod listening sessions. With that feedback in hand, nearly 800 volunteers dedicate over 12,000 hours in more than 100 different sessions to discerning the trends from the people, analyzing national and archdiocesan demographics, and sharing best practices from their personal, professional and ministerial perspective. Ultimately, those volunteers provide recommendations and rationales to Archbishop Wenski relative to 18 different areas of ministry. The Synod continues with 15 Focus Area Teams, composed of between 8 and 10 volunteers each, beginning the work of compiling all the feedback, studying the results, and coming up with recommendations. Their task is to come up with “SMART” goals — specific and attainable — by March 2013. Then, an Integrated Planning Team will begin studying the proposed SMART goals and determining their attainability, given the resources of the archdiocese in terms of finances, buildings and personnel. Deepening our discipleship through faith formation and support: Providing a consistent invitation and diverse opportunities to all Catholics, especially adults, to grow in understanding of their faith to be better prepared and equipped to invite others to know Christ. Providing coordinated, proactive support to all of the priests in the archdiocese to deepen their discipleship and strengthen their ability to form and lead the People of God. Expanding our missionary outreach to youth and young adults: Investing the human, financial and spiritual resources necessary to help both youth and young adults cultivate a personal and life-long relationship with Christ and to ensure that the Archdiocese of Miami becomes a model church in outreach to the Church of today and tomorrow. Establishing our parishes as centers of hope and evangelization: Supporting parishes in embracing the missionary call of Christ to “Go and make disciples of all nations” through creating a welcoming and vibrant experience of parish life. 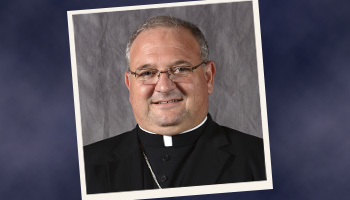 Miami gets a new auxiliary bishop, Peter Baldacchino, a native of Malta, product of the Neocatechumenal Way, and priest of the Archdiocese of Newark. Bishop Baldacchino is ordained to the episcopacy March 19, 2014. St. Charles Borromeo Parish in Hallandale, which closed in October 2009, reopens as Our Lady of La Vang Vietnamese Mission, the new home of South Florida’s Vietnamese Catholics. 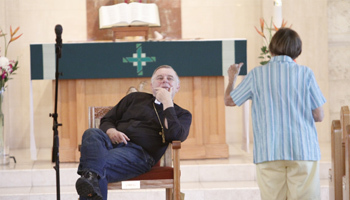 To comply with the Synod directives, the Archdiocese creates a Secretariat for Parish Life. The new secretariat will encompass a newly created Office of Evangelization and Parish Life, as well as the offices of Marriage and Family Life, Youth and Young Adult Ministry, and Missions. The Office for Youth and Young Adult Ministry re-opens in October 2014. 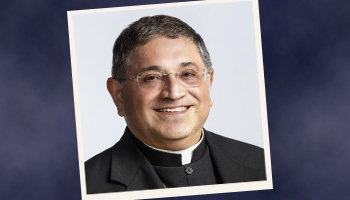 The Holy See names a second auxiliary bishop for the Archdiocese: Enrique Delgado, a native of Peru and Miami priest who is serving as pastor of St. Katharine Drexel Church in Weston. He is ordained to the episcopacy Dec. 7, 2017. 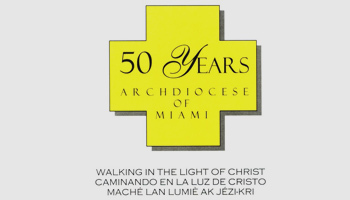 On its 60th anniversary, the Archdiocese of Miami numbers around 1.3 million Catholics, of which about 750,000 are registered in the 109 parishes and missions in Miami-Dade, Broward and Monroe counties. They are served by 227 diocesan and religious priests, 149 permanent deacons, and 271 religious sisters and brothers. The archdiocese also has 48 elementary schools, 13 secondary schools (four of which are operated by religious orders) and the only AdvancEd/SACS accredited virtual Catholic school in the U.S. The archdiocese also sponsors St. Thomas University, the only Catholic archdiocesan-sponsored university in the southeastern U.S.; and is home to the Adrian Dominican-run Barry University.